Middlewich is ‘one of Cheshire’s most intensively investigated Roman Settlements’. The town is a historic and ancient settlement situated in the heart of Cheshire, with its origins dating back to pre-history and the time of the first English hunter gatherers. Middlewich is a town that takes great pride in its abundant heritage, which ranges from Roman archaeology to the Industrial Revolution and the canals that were built to service the economy. Salt has always been a common thread of life throughout the ages; the Roman Army set up a permanent fort and established a settlement in Middlewich, supplementing it with industrial working areas. In later years, a medieval market emerged around the salt industry and its associated trades, founding the Middlewich that we see today. 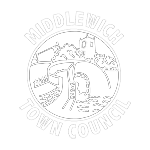 Recently, Middlewich Town Council has received £8,400 from the Heritage Lottery Fund (HLF) through the Sharing Heritage programme, which will go toward preserving and promoting history in the town. This particular grant will fund two exciting Middlewich projects, the “Middlewich Salt and its Roman Legacy” exhibition and the Virtual Museum you see today. Led by Middlewich Town Council and working with Cheshire East Library Service, Cheshire Museums, Middlewich Heritage Society and volunteers, the overall project focuses on revamping the 2001 Roman exhibition housed within Middlewich Library. This space is currently the only permanent heritage link to schools, the community and visitors, making it a highly valuable asset to the town. Collectively, we want to achieve a more effective use of the exhibition space in the Library. Our aim is not simply a one-off change to the Library Exhibition, but to build a programme of sustainable minor changes to accommodate different themes or new finds. This means that the new Middlewich Exhibition is a community driven and permanent public space that has the ability to adapt and evolve. We will focus on the relationship between the early settlers and modern Middlewich, which presents us with an opportunity to compare the different settlements through the ages and showcase new artefacts. As the project evolves we will be able, via this ‘Virtual Museum’, to increase community accessibility to objects found at Middlewich. These artefacts are important to our understanding of the town’s development. Kerry Fletcher, Heritage Development Officer says: “This award brings with it a fantastic opportunity for Middlewich to have greater control and flexibility over its heritage and what we want to convey. The library is a key site for the public to gain access to archaeology and information on Middlewich, whether it’s the local residents, schools or visitors to our town”. Laura Pooley, Keeper of Early History, Cheshire Museums, adds: ‘We are excited to be involved in a project that will make the archaeology of Middlewich more accessible to the people of Middlewich’.